Steve Harvey: Still Trippin' is the 90 minute sequel to Steve's comedy DVD Don't Trip. Still keeping his comedy "clean and family friendly", Steve talks about his personal experiences at work, with his family and his travels. Without using profanity, Steve Harvey proves why he is one of the Kings of Comedy. Steve Harvey - Don't Trip... He Ain't Through With Me Yet! is Steve Harvey's first stand-up comedy routine in 20 years without cussin'. 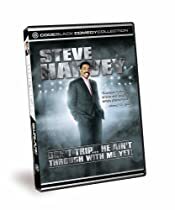 Filmed at Bishop T. D. Jakes' 2005 MegaFest Festival in Atlanta, Steve steps out on faith as he entertains MegaFest attendees without the use of profanity.